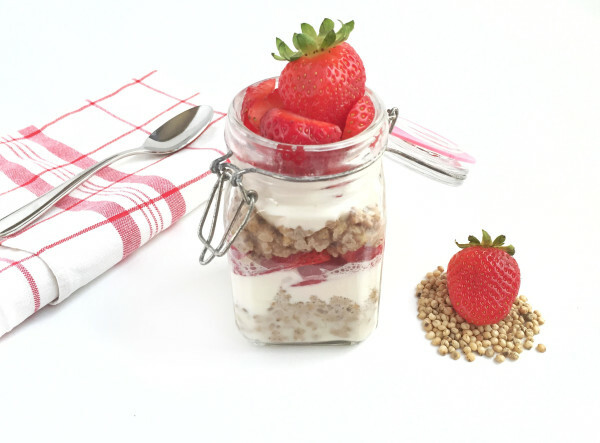 Whether for breakfast or dessert, this Strawberry Vanilla Sorghum Parfait is a sweet way to enjoy this gluten free ancient grain. Ancient grains are becoming more popular breakfast options, especially those that are gluten free. If you need a change of pace from your everyday oats, cereal or toast, sorghum is a fantastic choice for a hearty morning meal. Whole grain sorghum contains 5 grams of protein and 5 grams of fiber per serving. It’s also a source of phytochemicals such as phenolic acids, anthocyanins and phytosterols as well as policosanols that may have an impact on human cardiac health. Preparing meals with sorghum is an easy way to increase plant based protein in the diet. By cooking the grain in unsweetened soy milk instead of water, you gain an extra 6-7 grams per serving and create a sweeter base to top with fruit, nuts, seeds, yogurt, cottage cheese, ricotta or nut butter. To make the recipe vegan, simply substitute soy or coconut based yogurt for the Greek yogurt. Disclosure: I am a consultant for the United Sorghum Checkoff Program and I was compensated to develop this recipe. Some sorghum varieties take longer to cook than others, look for whole grain sorghum that cooks in about 45 minutes. This recipe can be served warm or cold. To save time, prepare the sorghum the day before and refrigerate. If needed, add some additional soymilk to moisten prior to serving or heating. Sorghum freezes very well without getting soggy, you can cook a larger batch and freeze the leftovers to easily defrost another day. This recipe is also delicious with blueberries, raspberries, bananas, peaches and cottage or ricotta cheese. So pretty! And what an innovative idea for breakfast. Love that you are pushing sorghum into the spotlight. One of my favorite grains. those nutrition stats! Delicious and filling breakfast! OK – I have got to try sorghum and this recipe is calling my name! This sounds so delicious! A perfect breakfast!